In the last few years, Christmas advertising campaigns have started earlier and this year is no exception in the UK. Today, Argos and Aldi unveiled their Christmas ads, with Argos’s one airing tonight during Coronation Street on ITV and during Googlebox on Chanel 4, after 9pm. 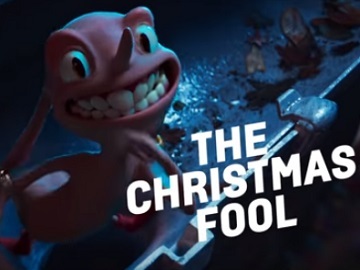 The spot, created by The Partnership London and promoting Argos’s click-and-collect system as a quick and convenient way to buy a Christmas present, features a Gremplin-type Christmas fool that wreaks havoc by doing all kinds of things, such as breaking fairy lights, hiding the sellotape, damaging gift boxes and the Christmas tree, hiding a scrabble piece, stealing the instructions manual for the assembly of a wooden house, and turning snowflakes into drizzle. Finally, when he’s about to ruin a party, he has a surprise. Gary Kibble, Marketing Director at Argos, said: “Many of our customers told us that they try to create the ‘perfect’ Christmas but the reality is things go wrong and it can feel like there’s a mysterious force working against them. We created the Christmas fool in our ad to bring this insight to life and show his mischief-making in action (…). We hope our customers will identify with the story in our ad and enjoy seeing the fool’s mischievous antics get thwarted”.